The human stories of homelessness, and the human touch needed to better support people, have been documented in a novel ‘photovoice’ project launched today by Minister Katherine Zappone. lived experiences of homelessness from children, adults, service providers and front line staff. 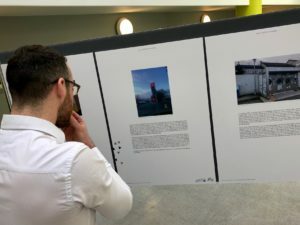 The report is complemented by a parallel photo exhibition event taking place at South Dublin County Council Libraries in Tallaght and Clondalkin. The report and photo exhibit highlight a clear wish from those affected and front line staff for interactions and services to be more personalised with greater skills and capacity to engage each families’ unique set of needs and solutions. The report was commissioned by the South Dublin Children and Young Peoples Services Committee (CYPSC) and supported by the Tallaght based Childhood Development Initiative (CDI). It includes detailed accounts from 19 participants in South Dublin County. It was launched today by the Minister for Children and Youth Affairs Katherine Zappone. The photovoice project was developed by Sociologist and UCD Research Fellow and Dr. Maria Quinlan together with photographer and visual artist Patrick Bolger. The photo exhibition has been on display in Tallaght library for the past two weeks and will be on display in Clondalkin library for the coming two weeks. The launch was also attended by the Mayor of South Dublin County Council, Cllr. Mark Ward who welcomed and commended the work. Less reliance on phone-interactions and more face-to-face engagement between families, services providers and front line staff. Ronan Cavanagh, Cavanagh Communications: (086) 317 9731.